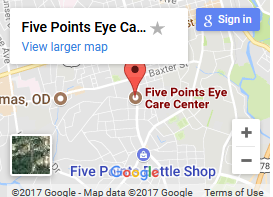 Five Points Eye Care Center performs comprehensive eye examinations on patients of all ages. We tailor examinations for the age and the specific needs of the patient. We believe that comprehensive eye examinations are an important part of the health care process, communicating with other health care providers as needed to give patients a team approach to their health. An eye examination can reveal signs of many systemic diseases, including diabetes, high blood pressure, high cholesterol, multiple sclerosis, cancer, brain tumors and general inflammation like rheumatoid arthritis. That is why we believe routine eye examinations are an important part of general health care. Comprehensive eye examinations are much more than just getting a glasses prescription. The doctors thoroughly examine the front and back part of the eye for any eye or systemic diseases and also screen for glaucoma. In fact, determining a glasses prescription is a separate procedure from an eye examination and is called a refraction. Many times the doctors will perform a refraction at the same time as a comprehensive eye examination, depending on the needs of the patient. Our eye doctor in Athens strive to personalize the examination based on the needs of the patient, leaving plenty of time for any questions or concerns you may have. What Happens During An Eye Exam At Our Athens Optometry Practice? This is a measure of the size of letters on a special chart that can be seen at a certain distance. "20/20" means that at a distance of 20 feet (the upper number) a person can see letters of a certain size (the lower number). Twenty feet is the distance at which the focusing apparatus of the eye is in a resting position and therefore is a measure of your distance visual acuity. Near visual acuity is usually measured at the patient's usual reading distance, normally fourteen to sixteen inches or 40 centimeters. The refractive examination is the process by which the doctor determines what lenses help you achieve your best visual acuity. Your "visual acuity" refers to the clarity of your central vision - how well you see objects in your direct line of sight. Your acuity can be affected by both internal and external conditions. Lenses "refract" (or bend) light. By using the proper lenses, light can be focused at the correct place in the eye, enabling a person to see clearly. During the examination process, our Athens eye doctor is testing your ability to recognize symbols (such as letters on an eye chart). Most often a phoropter is used to demonstrate different powers of lenses for you. The phoropter is the instrument you look through as the doctor asks you, "Which lens is better , one or two?" Your responses help guide the doctor in determining your refractive error and which lenses are necessary, if any, to bring you to your best acuity. An eyeglass or contact lens prescription includes the powers required to give you your best vision. It is important to understand that 20/20 vision is not always achievable through the use of lenses. There are many diseases and conditions of the eye that might prevent clear vision with glasses. During the course of an examination your optometrist in Athens, GA may look for some of these problems to explain your decreased vision. A glasses prescription is the result of the refraction described above. The numbers in a prescription are the instructions needed to make your glasses the proper power. A glasses prescription is also necessary to determine the starting powers for a contact lens fitting. Contact lens prescriptions require much more information than a glasses prescription and are specific for the actual contact lenses prescribed. The biomicroscope, or slit lamp, is a vital tool in the examination process. It is a special microscope used with a high-intensity light source that can be focused to shine as a slit or left unfocused to provide general illumination. Doctors use the slit lamp to see the different parts of the eye in extensive detail. 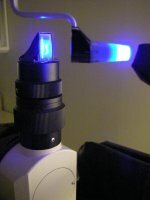 During the slit-lamp examination, the doctor looks at structures that are at the front of the eye (the anterior segment): The eyelid, the sclera (white outer structure of the eye), conjunctiva (membranes lining the eyelid and sclera surface), iris (colored part of the eye), natural crystalline lens, and the cornea (thin transparent membrane that covers the iris and the lens). Certain diseases that affect the cornea like dry eye syndrome as well as cataracts and other conditions of the eyes can be detected during this part of the comprehensive examination. The biomicroscope is also used when the doctor examines the inside of the eye to check the optic nerve, retina and retinal blood vessels. This is a measurement of the pressure of the liquid inside the eye, called the intraocular pressure (IOP). This is often referred to as the "glaucoma test" since having too much pressure inside the eye is a risk factor for glaucoma. However, this is just one test that doctors use to determine whether or not a patient has glaucoma. Glaucoma is a disease of the optic nerve which is the cable that connects the eye to the brain. In glaucoma, the high pressure inside the eye damages the optic nerve and can lead to blindness if not treated. Most patients usually notice no symptoms during early stages of glaucoma, which is why our eye care experts in Athens, GA measure the pressure inside the eye during a comprehensive eye examination. Glaucoma is treated by prescription eye medications and several types of surgeries. During tonometry, the eyes are first numbed with anesthetic drops. Our office uses the "gold standard" of eye pressure measurements, called applanation, which involves contacting the cornea with a pressure-sensing device, illuminated by a blue light. For certain patients we also can use a small hand-held tonometer called a Tonopen. The patient does not feel anything and the process takes only a few seconds. The measurements provided by this examination are instrumental in determining whether or not additional testing for glaucoma is warranted. Dilation is necessary to see the internal structures of the eye. The muscles in the iris have a natural reflex that makes the pupil smaller when light is shined on the eye. The dilating medication temporarily paralyzes these muscles and broadens the view of the retina, vitreous and blood vessels. Without dilation, it is difficult or impossible to determine the health of the periphery of the retina. It is part of a comprehensive eye examination and is considered a standard of eye care today. Dilation of the pupil is important for the inspection of the internal structures of the eye. A thorough exam with dilation is often the first step in diagnosing a condition that could possibly have devastating effects on your vision. It enables the doctor to evaluate the periphery of the retina, looking for tumors, retinal detachments, hemorrhages and other eye diseases. There are no pain receptors inside of the eye, so thorough examination with dilation is often the first step in diagnosing a condition that could possibly cause severe vision loss. During this part of your Athens eye exam the doctor uses different instruments to evaluate the health of the retina. Often, a binocular indirect ophthalmoscope is used, which is a specialized microscope with a bright light that the doctor wears on his/her head to view the retina. This instrument is valuable for evaluating the periphery of the retina. Many doctors also use a slit lamp and a small lens held in front of the eye to evaluate the central part of the retina. Due to the widening of the pupil, dilation may cause light sensitivity (usually less than 4 hours, but it may last longer depending upon eye color). Most patients experience difficulty reading for several hours after dilation. While most patients do not have problems driving immediately following dilation, we encourage patients to have a driver with them in case they feel uncomfortable with their vision. You should not operate dangerous machinery until the effects of dilation have worn off. We can reschedule dilation for a more convenient time upon patient request. Not all patients can be dilated and the doctor will determine the potential for dilation during the examination before dilation is performed. All children receive their first regular eye examination at 6 months of age. If all is normal at the 6 month evaluation, the next examination is recommended at 3 years of age. Between the ages of 6 and 18 an eye examination is recommended before the 1st grade and every 2 years thereafter or yearly for children at risk or with current eye problems (this includes children whose parents developed eye conditions when in elementary school or children wearing glasses or contact lenses). Patients between 18 through 40 years of age should be examined every 2-3 years*. Patients between 41 through 60 years of age should be examined every 2 years*. Patients 61 years old and older should be examined yearly. *Patients with current eye problems or at risk to develop certain eye conditions should be examined yearly regardless of age. This includes any patient who currently wears contact lenses. Contact lens wearers should be examined at yearly intervals or more frequently as the doctor directs. Learn about what to bring at an eye exam.